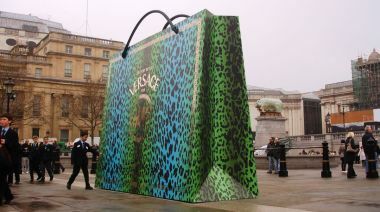 ICON created five oversized handbags that were dropped at several key London locations in a very memorable PR stunt. The bags were used in a later campaign for the launch of David Beckham’s underwear line. These incredible bags were created using a wooden framework that gave the structure its signature shape. A Dibond aluminum composite panel system was hung from this wooden framework, with digital graphics placed on the side panels. Interestingly, the bags’ handles proved to be most challenging, in fact a mixture of plumbing equipment and computer cable were the end result. Another key challenge that effected the designers was weight, not wanting the bags to topple over in the wind, a specialized engineer was involved in calibrating the precise weight needed to avoid such an incident. 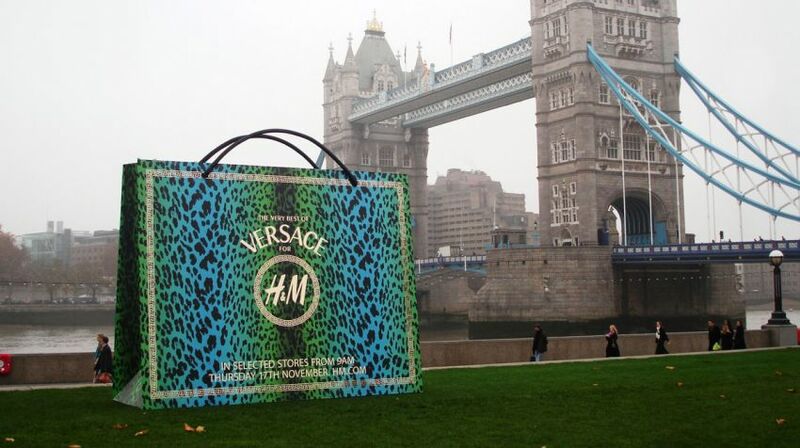 A corresponding social media campaign encouraged shoppers to take their pictures with the oversized retail bags and in return each customer received store coupons. This project won the 2012 Visual Merchandising Awards for Most Outstanding Feature/Prop.